Maybe you’ve shared the same or similar thoughts? If so, please humour me whilst I try and explain why I think none of the above are actually the case. You’ll have to take my word for it that I’m a pretty ordinary human being in most ways, and yet I was inspired to get involved in direct action. Yes inspired, not alienated, but inspired. So I obviously believe that NVDA can be inspiring and can attract new people to our causes. I was a teenager in the 1980s amid another eruption of interest in the environment. There were countless ways I could have got involved in making change, but NVDA stood out precisely because it seemed to be having an effect in stopping ‘the bad stuff’ happening. I could join the dots from taking action to ‘less bad stuff’ and see a direct and clear connection, and frankly that was me sold on NVDA. Inspiring and effective. Still works for me to this day. So what about negative? What’s wrong with stopping injustice or standing up against the more inhuman and inhumane aspects of our society? As long as there has been injustice there have been people opposing it and I have no problem with that at all. But the good news is that NVDA encapsulates a whole range of ‘positive’ action. Whether it’s a Food not Bombs action, reclaiming a plot of land for a community garden, or setting up a housing co-operative to provide affordable and self-organised living spaces, all of these are radical action providing alternatives to an unjust system. I know very few direct activists that aren’t involved in these kind of projects in one way or another. Is nonviolence a misnomer? Are our actions worthy, maybe even justifiable but ultimately violent? I’ll talk for myself – for me intention is the key. I know that I can never set out to take NVDA without the strong possibility that I’ll offend someone, or need to cause damage to property of some kind. Is that violent? I don’t think so, as long as my intention is to be respectful of all living beings. And property? It’s the same argument as kicking down your neighbour’s door in order to rescue them from a fire. Great if you can avoid it, but in the circumstances entirely warranted and certainly not violent in my book. And for those that think nonviolent direct action is divisive within the activist community, accessible only to the elite – the young, the fit,and those free from responsibilities such as kids or proper jobs. Get out there and look around. there are male and female direct activists, young and old, able and less-able bodies. 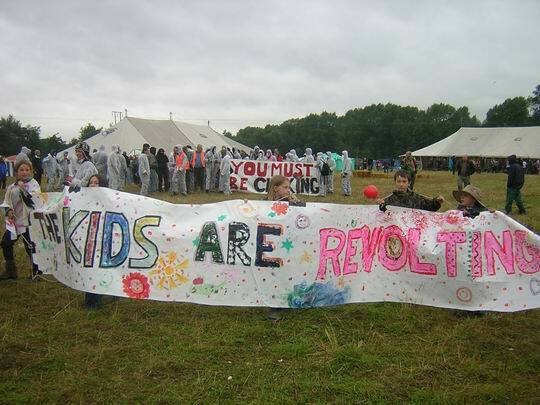 In many recent mass direct actions there’s been a kids bloc – a dedicated group of adults and their children. Frankly I always feel put to shame by that generation of ex-Greenham women, mostly at least 10 years older than me, for whom a 10 foot fence or a moving convoy of vehicles is a mere irritation. That’s not to say I’ve never encountered barriers. There was a time in the 90s, when the roads protests were at their height, when it could feel difficult to be a newcomer who’d never lived in a tree. But at the very same time, loads of first time direct activists were inspired by those same protests. And, far from alienated, the communities often rallied round and learnt to bake vegan cake. The same is true of all the communities I’ve been active within. Not everyone agrees with or gets your politics. Not everyone understands why you took that form of action. Not everyone wants to join your campaign, but people do understand the positive intention and the passion. Yes it can be harder in an area where the target of a campaign is a major employer. Clearly it’s not in people’s interests to support direct action against their bosses. But many campaigns do build surprisingly strong relationships based on mutual respect. NVDA’s a bit like vegan cake – it may not sound appealing, it may be outwith your experience. But try it, you may be pleasantly surprised and find that your preconceptions were wrong. There’s loads more to say, but no doubt we’ll come back to NVDA over the months and years. In the meantime this gives you an idea why Rhizome supports communities to take action.